Come and hire the studio from just £20/hour. It's beautifully formed with a floor to ceiling cyclorama/infinity cove, pro lighting system, 2.7m Colorama backdrops, changing/makeup area, tea and coffee on tap, in fact everything you need for a successful shoot. Studio hire includes use of all lights, modifiers and backdrops as well as basic assistance with set up for the duration of your hire. If you require specific coloured backdrops please contact us before booking and we will get them in. Hire the studio for £20/hour Mon - Fri (8am - 6pm) and £35/hour evenings and weekends. Book a full weekday (8hrs) for £120 or £70 for a half day (4hrs) and if you’re a student you get 10% discount on your hire cost. We're always happy to work with you to help you get the best out of your time in the studio. For lighting/technical assistance during your shoot there is a charge of 50% of your hire cost. We want everyone to have a fantastic and rewarding time in the photo studio. Whether you're experimenting with light and colour in the cyclorama, shooting portraits in the alcove or green screen video against the backdrops you'll have exclusive use of the whole studio for the duration of your booking. We'll be on hand throughout your time to ensure everything goes smoothly and put the kettle on when you fancy a break. Come in and see for yourself, we're always happy to chat through your requirements. 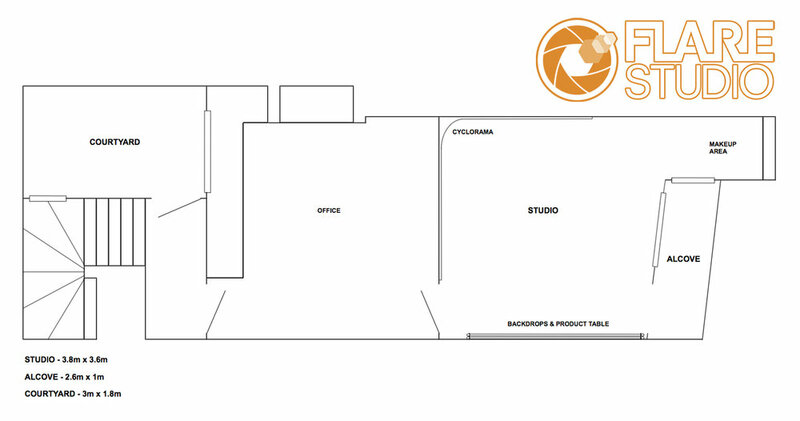 Below are a few shots of the studio and a list of equipment available to use.